Rare cover with additional 'Hong Kong Government Office' meter mark. Rare cover with additional 'Hong Kong - Wonders Never Cease' meter mark. 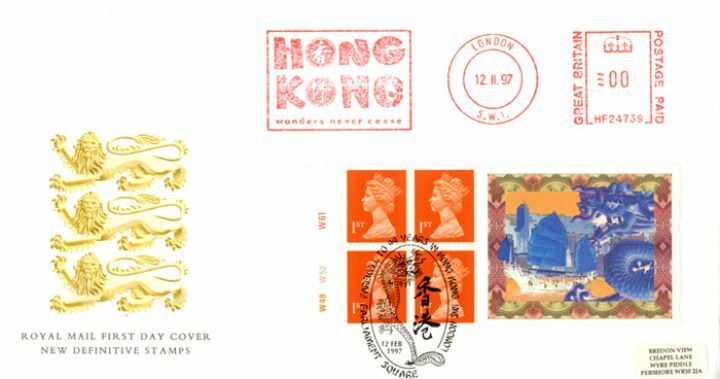 The above Royal Mail Window: Hong Kong Hand Over stamps were issued on 12 February 1997 by Royal Mail and feature the following stamp designs: . The Meter Marks first day cover with the Chinatown, Junk, Special Handstamp postmark has been produced by Royal Mail/Post Office and features these stamps which can make a very collectible and lovely gift.